Viral videos have been all the rage the last few years and seems Nickelodeon is jumping on the viral video bandwagon with it’s new viral video show aimed at kids. Nick fans can rejoice because soon you may have a shot to tryout for a game show and “Go Viral“! Ryan Seacrest has entered the Nickelodeon arena as the producer of “Go Viral” and the Nickelodeon Network has ordered 40 episodes of the show. The shows format is a kids game show. the half hour episodes will cast kids to go rounds against other kids in challenges that are inspired by what else…. viral videos. The show’s challenges will involve kids watching a bit of a viral video and either having to guess at the outcome or guess on whether the video actually went viral and how far that popularity stretched. The show will be filmed in studio, most likely in front of a live studio audience which means kids not only may have a chance at getting cast to compete in the show, but also be able to score tickets to the shows live filming. The show will be produced by Ryan Seacrest Productions. The show’s working title is ‘Go Viral‘ and that title may change at a later date when the show gets closer to its air date. The show is scheduled to film in the Los Angeles area and producers will need to fill all 40 episodes that have been ordered with kids who want to be on the show. Very soon we should begin to see casting calls going out for the new Ryan Seacrest nick game show and get more details about the age ranges that the show will be casting for as well as what the pries will be for the kids who win the game. Remember some of Nicks past game shows? Those were just so much fun! This is not the first game show that Nickelodeon has aired, a little while back Nickelodeon had a game show called “Figure It Out“. 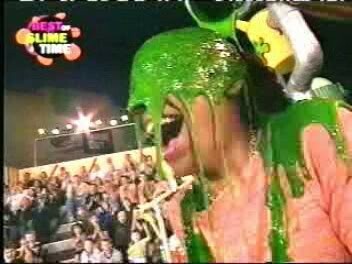 And who will ever forget the Nick classic slime show, slime time? Nickelodeon Casting calls should be coming soon. “Go Viral” should be filming shortly in L.A. and casting for the show is already beginning. The new series is tentatively scheduled for a summer of 2014 launch date. While Ryan Seacrest and his production company are producing the show, rumor has it that someone else will be hosting. We can understand why Ryan can’t host the show… Ryan has been such a busy man. Seriously between the Kardashians, American Idol and all his red carpet work, we could imagine he is a bit strapped for time. So what do you think, is there room in the Nick arsenal for a hit game show? Of course, we can’t wait for production to begin and casting calls to go out for what sounds like a really fun new Nickelodeon series in 2014! My name is Majo. I am 12 years old, almost 13 but I look bigger, it will be a honor if you consider me. I will love to be on go viral. I’m African american, my eyes are brown, my hair color is black and brown a little bit on the ends. I’m 5’1 and am a little tall for my age. I would love to go on that show. I’m 11 and I will be honored to be on that show. Hello. My name is Joseph Brennen, and I would love to be on this show. I would love to be on this show, because I’ve always wanted to be a part of a nickelodeon game show, because they are so fun, and so challenging. If I were to get this audition, I wouldn’t let anyone down. Please just contact me via e-mail if I get the audition. I really hope I get this, It would be completing my life long goal to be on nickelodeon. Thank you for reading and I hope you have a wonderful day. Please consider this, it would be amazing for me. P.S. I am 11 years old. My eye color is hazel, I am 4 foot 9 inches. My hair color is light brown and I have a fun-filled personality. Reason: I want to help out my other family, who lives in a 3rd world country. I can act, sing and I can pretty much dance. I’m not camera shy, I have curly black/brown hair, dark brown eyes and well I’m Asian BUT! I look Hispanic. It don’t bother me to do small roles. It doesn’t bother me not to be ‘THE MAIN’ character either though. I just really want to go after my dreams and become an actress and a singer. I am 14 years old but I look older( 17-18). I’ve been told a lot about that. I REALLY HOPE I GET A CHANCE AT THIS. My dream is to expand my talents and become an actress. I am 5’11″, I have blue eyes, blonde hair, I am Aboriginal, and always up for anything! I am writing to inform you that i would like to be on the show “go viral”. I have black hair, dark skin tone and brown eyes. I rap, I was actually in a competition called “youth talent” and I would love to be on the game show. My name is Carson Freeman. I am 11 years old . The reason I want to be on this show is because I love Nickelodeon. Carson, that is an honest and excellent reason for wanting to be on the Nickelodeon show. I am a huge nick fan . I am a representative at MM and I love game shows, I’m an actress and a model . I am African American. Dark brown hair , brown eyes I’m 5″4 I’m 13 turning 14 September . I wouldn’t mind coming on that show, I would LOVE IT . Please email me or contact me. I want to be a nick star, I so love this site.